Lush threads for the discerning RX-7 owner. Ah, the things you find when searching for RX-7 memorabilia on the internerds! Back in good ol’ 1985, owning a Mazda RX-7 meant Serious Business. 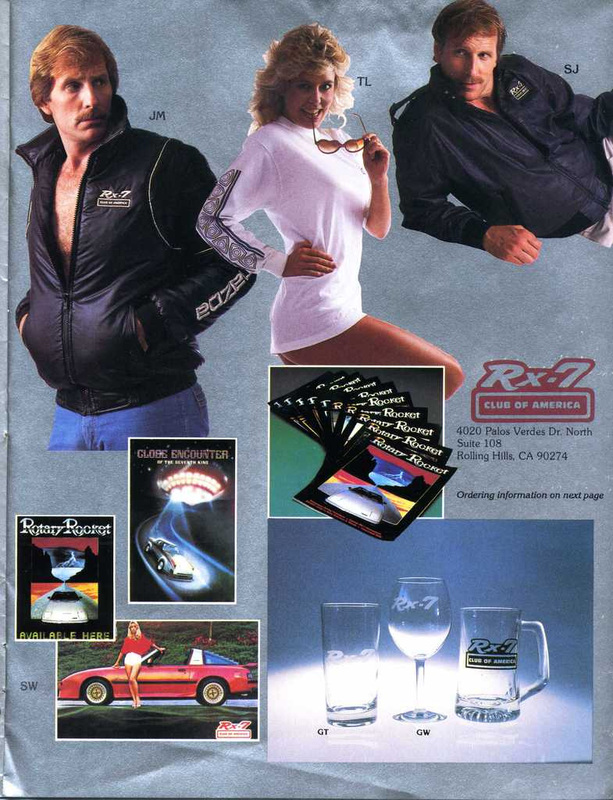 So serious, in fact, that the official RX-7 Club of America produced its own line of contemporary clothing, including a very swish John Player Executive jacket for the guys, and a whole range of fashion accessories and publications. Best worn with Ludicrous Shades, Your Best Pornstache, and Judas Rockin’ Priest blasting out the stereo! RX-7 Fashion '85! Pastel and big hair galore. ...and rocking jackets with nothing underneath. with thanks to Foxed.ca – home of the largest collection of out-of-print Mazda manuals. Authors’ Cars: this is why squid will never be finished, Ed! After selling my white T-top MR2 SC, I lasted all of two weeks before giving in to temptation and commenced searching for another AW11 to trundle around in for everyday duties. If anyone’s keeping count, this is number five. Then just as I was about to give up, I received a phone call from a good friend in Wellington saying that one of his mates was selling a tidy hardtop manual AW11 SC, in more or less standard condition, and was I interested at all? And it's all over you. Electric Blue. Much like the “FC3S Infini has more power than the regular version!” rumour floating around the internet and countless forums*, there exists a similar old wives tale regarding the “smoked” (or facelift) tail lamps on the R30 Skyline. I’ve now lost count of the number of times (no doubt Michael has as well) I’ve seen the dark coloured HR30 smoked tail lamps being advertised as DR30 ones, and usually with a hefty price premium attached. Simply speaking, when the facelift R30 range was released Nissan decided that they would set the DR30s apart in more ways than just the glaringly obvious front-end treatment by subtly colouring the backing of the rear lamps a different shade of grey to the HR30 ones. This is not to say, of course, that facelift HR30 lamps aren’t worth anything – in fact, they’re still worth quite a bit of coin – but yeah, just some misinformation that I thought I would clear up once and for all. And no, my HR30 lamps ARE NOT for sale, don’t bother asking. A recent post on the JNC forums reminded me of this article I had in a magazine. I spent a while trying to find the magazine amongst the pile of them that I have, eventually coming to the conclusion that I left it with ANOTHER pile at my brother’s place. In the end, I found it and here it is for you to read. 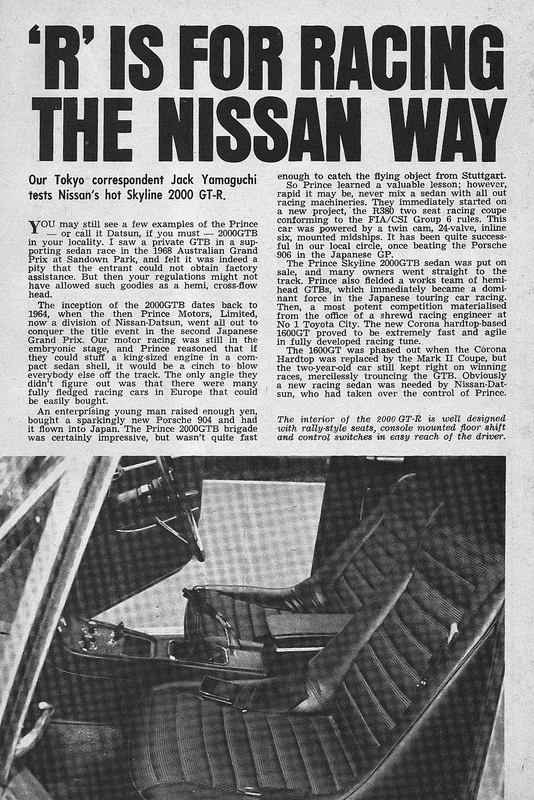 Interesting (I think) that it was mentioned in an Australian sports car magazine but then not really ever again, despite it’s success in Japan and the popularity of the previous GT-B in Australia.